Ericsson’s acquisition of CENX is not simply a “business” event, it promises to move forward Ericsson’s ability to execute an effective closed loop, and therefore automated healing, scaling and capacity management. Suffice it to say that job #1 is actually creating the pieces for a loop. 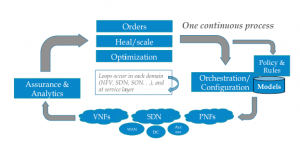 In NFV, SDN or any complex service, this means a) being able to orchestrate the resources, such as VNFs, b) being able to orchestrate across all technical sub-domains, c) being able to collect performance/fault data and identify the root cause, and d) knowing where and how to take corrective action. This fundamentally requires orchestration (fulfillment) and assurance, as well as some glue logic, hopefully in the form of very general rules or algorithms. Ericsson, in part through a series of significant acquisitions, has amassed abroad and Impressive portfolio of management software. Yeah they have always had a weakness; a relatively weak assurance portfolio. Ericsson’s two products in assurance – “Expert analytics” and it’s very solid service quality management (SQM) module are strong in their own rights, but neither is intended to handle the chores necessary to drive a closed loop of healing and scaling. Enter CENX, which is. CENX was architected and built with the core value of understanding the complex relationships between technology domains and the many layers that exist within public telecom networks. Rather than focus on collecting new data, CENX concentrates on cleansing, normalizing, and interpreting that data such that intelligent remediation can take place. Combined with Ericsson’s Dynamic Orchestration, the Swedish giant now has all the piece parts to orchestrate a service, monitor all of its components, understand complex dependencies, and take corrective action. That’s an automated closed loop. Having the piece-parts is necessary, but not sufficient. We hope that Ericsson realizes this and it makes the necessary investments such that CENX can provide root cause identification and the contextual intelligence necessary to make the most effective remediation. This will require the creation of rules and logic to interpret results, filter through possible actions, and provide the “short list” to orchestration. Similarly, we hope that Ericsson uses “intent-based” models within Dynamic Orchestration to further simplify. Why? Because intent gives orchestration the freedom to re- implement the original plan, but with updated information about failures, congestion, or whatever the root cause was determined to be. Bottom line: intent means you don’t need to write any additional code to heal or scale. Isn’t that cool? In summary, the acquisition of CENX gives Ericsson the fundamental tools to move closed loop automation forward at its clients. Given Ericsson’s size, this is potentially beneficial to a significant portion of the marketplace. Success however, in this dynamic and complex market, is not guaranteed; Ericsson needs to complete the closed loop architecture and hopefully do so elegantly. On the flipside, its customers need to recognize the value and support Ericsson in building better future for both. Investments, and success, are not free.